Best plant host plant for Monarch butterflies. From the butterfly larval stage to adult butterflies, the butterfly milkweed is the best plant for butterfly food source. Monarch Butterflies use milkweed plants as their hosts. An excellent magnet for butterflies and hummingbirds early summer to fall when this milkweed is topped with bright orange flowers. 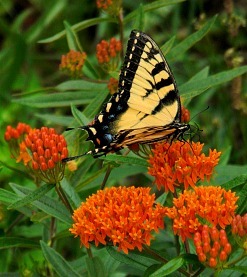 Orange Butterfly Weed is a U.S. native perennial plant and grows best in the Eastern and Southern regions. Prune to extend the blooms into late summer to fall and then enjoy later the winter seed pods and dried flowers. Tips on growing Milkweeds: deadhead for extended blooming from summer to fall, late to emerge in spring, plant with companion plants such as Hello Yellow Butterfly Weed, Goldenrod, and Russian Sage Little Spire. Orange Milk Weed Asclepias tuberosa grows approximately 18 to 30 inches tall and spreads in the 12 to 24 inch width. Plant in full sun to lightly filtered shade. Adaptable to dry, well-drained and lightly moist soils. An excellent native perennial plant that's seed pods are also used for dried arrangements. Pair this native flowering perennial with the Hello Yellow Milkweed.